Kenny’s is proud to design and install a steam shower or sauna in your Kansas City area home. Our team of designers can work with you on your bathroom project to incorporate either into your layout. With the different tile and stone products available at Kenny’s, there is no limit to the possible combinations to create a dramatic design. Our team of experts can design the perfect steam shower for your Kansas City bathroom project. Steam showers have been used for years to provide both physical and mental benefits. A steam shower is basically a steam room that offers the normal features of a shower. They are usually installed in the same space as a normal shower, but has the steam function added in. With the various tile and stone options available at Kenny’s, a dramatic steam shower can create a spa-like ambiance in your bathroom. Steam showers offer many benefits. Not only can you achieve clearer skin, you can also help treat respiratory issues because the warm, wet heat opens up lungs and sinuses, which will help you breathe easier. A steam shower installed in your Kansas City area home can also provide stress relief. The steam and water creates a soothing relaxation of sore and tense muscles, and the warm air can release endorphins in the brain to relax your mind. Regular steam showers can even help with weight management, because the hot steam increases blood flow and circulation, which can speed up your metabolism. Combined with a healthy diet and lifestyle, steam showers can result in a healthy body. Kenny’s can also install a sauna in your Kansas City area home. Saunas have been used for years to help the body recover from ailments, reduce stress, and release toxins. The simplest explanation is that the heat of the sauna increases the heart rate and makes you sweat, which releases toxins from the skin. It is important to make sure and check with your doctor before installing a sauna in your home. We can install a traditional Finnish sauna or a custom sauna with a variety of upgrades. 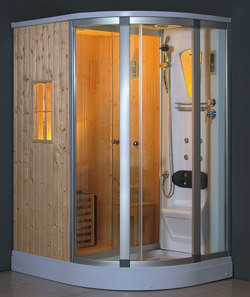 Kenny’s is a proud installer of amerec© saunas. These saunas are made with the finest Western Red Cedar available. This material has an extremely high quality and performs well in a sauna environment. We can install a variety of styles that will fit the décor in your Kansas City area home. Call us for a free estimate and for all the options to install a sauna that will help you both in mind and body.